Hamsters – these lumps of joy. They're whimsical, fun, and contrary to belief, very clean. Buying a hamster is a responsibility, You have to understand that this animal is completely within Your power and so care over them, is Your first task. Hamsters kept in an aquarium or cage. He and the other house you can buy in the pet store. There You will be able to buy chips and special fillers. The arrangement of the cells, this is an important point. If You want to have Your pet conveniently take care of the troughs, the trough and sufficient quantity of all kinds of straw, from which the hamster will build a nest. 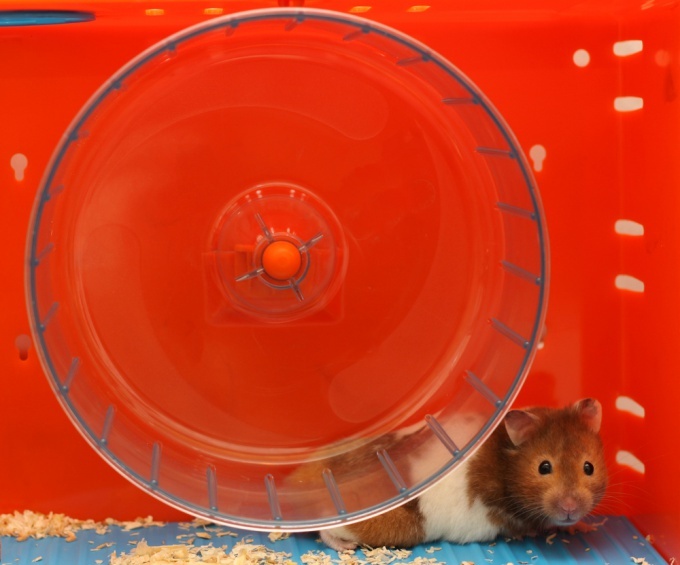 Today pet stores offer ready-made "houses" for hamsters, however, the practice shows that animals rarely want to live in them. More often they dismantle them for parts and build their own "housing" themselves. Hamster – pet disciplined and take care of hamster is also need in a particular order. Your pet conditionally divide the entire area of the cells in the zone. In one corner is a toilet, it will have to clean every day, otherwise the smell will be amazing. In the other corner is a nest, and nearby under a mountain of sawdust will be a storage room. The pantry is a very important place. In any case, you cannot get food from the pantry and pick it up. You risk to cause the animal stress. The cage should be removed every three to five days. The toilet, as already mentioned, every day. During harvest pereselyayte hamster in a jar or a bowl. To turn sawdust need not fully leave one-third of the old flooring and desipite two-thirds fresh. Wash the cell by specialized facilities, or water with salt, baking soda. Once a week, it is necessary to wash the drinking bowl. Trough wash just with water, otherwise You run the risk of poisoning the hamster. To change the drinker need each month, they guarantee the health of Your hamster. Regarding the feeding, a controversial issue. The hamster will eat all the time, it was ingrained in his nature. You need to develop the plan and in accordance with it to feed the hamster. In addition to forage, you can give raw vegetables and a special "brittle" from the cereal. The hamster bathing should be rare. These animals handle themselves with cleaning their skins. However, to prevent you can put the hamster bath sand that will delight. In addition, there are special funds for the care of hamsters, but the reviews on them are not unique. Overall, You just need to take care of the hamster, to follow activity and weight, how he eats and drinks. Soon You will get used to his habits and will begin to notice if something is troubling Your pet. Like everything else kids, newborn hamsters are very sweet. And just as in need of care. Happy mother obeys instinct and knows what to do. And how to behave to the owner, not to harm any babies or parents? Noting that females have a little belly, take care of her, and especially the happy father. A couple must be separated. A stay can cost the male life. Make sure you have another cage. Wash it and disinfect. On the bottom place the material from which the expectant mother will build cozy warm nest for their offspring. Most suitable straw. Do not use cloth or cotton, they are dangerous for kids. Newborn hamsters are very fragile, any thread can destroy. Also, you need to observe the rules of hygiene, and in tissue or cotton wool various microbes feel very comfortable. Don't forget that the little hamsters in need of shelter. And, of course, the cage must be feeders and waterers, and that's without toys a female can and as long as to do, doing it enough. Straw may seem unnecessarily harsh, but the female will chew into the soft bed. The nest the female will prepare exactly to the time of delivery. If the cage has a house, a hamster will go to give birth there, and in the early days you kids will likely not see. If the shelter is not, adding to the family you will notice right away. Do not consider kids immediately after they were born. Mom is feeling, who is viable and who is not, so after a few hours you were missing a few babies. Do not try to save them, you can destroy the rest. Generally, in this period, to reduce interference in the family Affairs of your Pets to a minimum. Keep in mind that if the female is well fed victims of natural selection will be less, because it will be able to feed more babies. 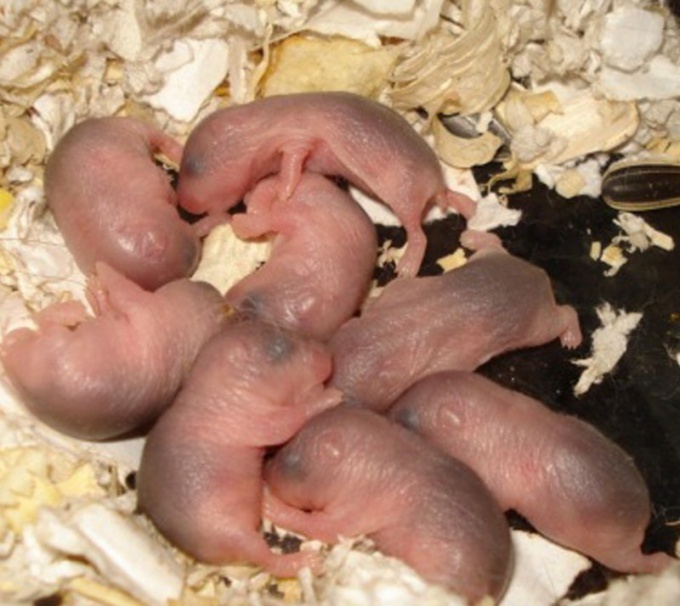 Hamsters from the same litter can be up to a dozen. Newborn hamsters in any case can not be touched. The young mother a heightened sense of smell, she is acutely aware of odors that seem hostile to her. Therefore, it is likely to cease to feed the hamster that you hold in your hand, and even can tear. It is best to leave the family in peace and wait a few days. Special attention should be paid to a nursing mother. There must be enough food. In regular food every day to add vitamins. In the cage should always be fresh water. In the first two days to carry out General cleaning in the cell is not necessary. Two days later, kids and mum can be transplanted at a time in a separate box or spare cage (but not to the father) to change the filler and straw. Further cleaned up in a cage every two days. When the hamsters a little bigger and covered with hair, begin to introduce solid foods. Put into the cage a few cabbage leaves. Kids will love to chew on them. After a few days when the baby turns a month, you can start giving boiled chicken. Portions should be small. The fact that hamsters do not eat, get out of the cage. After six months the family will have to settle. Females can be send to the male – and now he is not in danger. Toddlers are already able to live without parental care.